WALDORF, MD -- Southern Maryland Blue Crabs president Patrick Day announced that manager Stan Cliburn’s contract has been extended for the 2016 season. Currently in his 24th season managing a minor league club, Cliburn reached 1,500 managerial wins on Tuesday, June 2against the Sugar Land Skeeters. 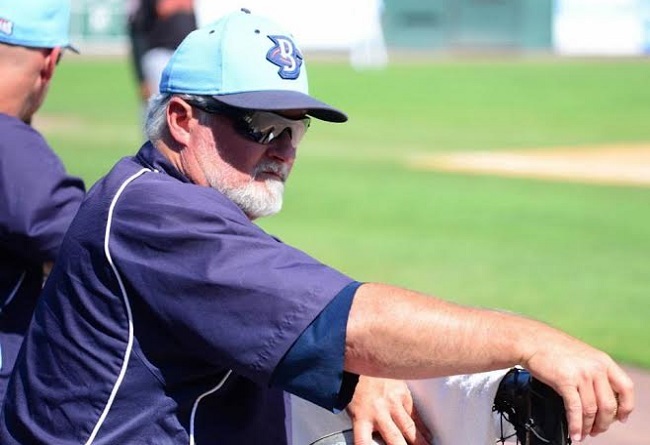 The skipper, in his first season with the Blue Crabs has already led his team to a playoff berth, winning the Freedom Division 1st Half Title. The Blue Crabs will begin the Freedom Division playoff series on Wednesday, September 23 on the road for Games 1 and 2, then return to Regency Furniture Stadium for Game 3 on Friday, September 25 and Games 4 & 5 on Saturday and Sunday (if needed). The Division Series is best 3 of 5 games. Cliburn, 58, was drafted by the California Angels in 1974 and spent five seasons playing catcher in the Angel’s minor league system. At age 23, Cliburn reached Major League Baseball for the California Angels and appeared in 54 games during the 1980 season. Cliburn and twin brother Stew are one of nine sets of twin brothers to play in the MLB, and one of only two of the nine sets to play in the same organization (California Angels). After retiring from playing, the Jackson, Mississippi native coached in various levels of minor league baseball, including stints managing the Rochester Red Wings and the New Britain Rock Cats- both of which are Minnesota Twins affiliates. He went on to manage the Sioux City Explorers before taking the hitting/bench coach position with the 2014 Atlantic League Champion Lancaster Barnstormers. Cliburn was hired by the Blue Crabs in the off season following the signing of Blue Crabs Manager Lance Burkhart by the San Diego Padres. About The Southern Maryland Blue Crabs: The Blue Crabs play 140 regular season games in the Atlantic League, considered the highest level of Minor League Baseball. The Atlantic League is the only non-affiliated minor league to have a Working Agreement with the Office of the Commissioner of Baseball. Atlantic League players are “Major League-ready” and over the last 17 years, more than 650 players have advanced from Atlantic League clubs to Major League organizations, making the Atlantic League a preferred route for experienced players to be scouted by Major League Baseball. The Atlantic League also serves as Baseball’s primary laboratory, being the first to try “Pace-of-Play” and other initiatives before their adoption by Major League Baseball. The Blue Crabs play at Regency Furniture Stadium in Waldorf, Maryland. Please call 301-638-9788 or visit www.SOMDbluecrabs.com for more information and to reserve your seat at the ballpark today!